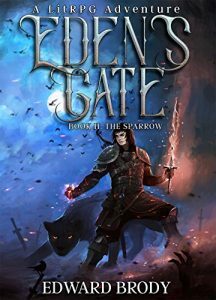 After accepting the fact that he will never know his old reality again, Gunnar looks forward toward building a new life inside Eden’s Gate. It’s time to form a guild, gather resources, and earn the acceptance of the Edgewood inhabitants. The dark elves aren’t thrilled about having humans in Edgewood, the mine isn’t vacant, and you can’t form a guild without at least a few guild mates. Will Gunnar pursue Adeelee? Is Rachel still out there somewhere? And who is Jax exactly? Could he really be a Sparrow?